It’s been a good start to the new school year with our first Parents and Friends meeting. It was great to see so many enthusiastic new and old members at the meeting. The new P and F team are Lisa Moyle as Coordinator, Tracey Charleson as Secretary, Patti McNulty/Taroola Cameron as Treasurer, Emma Chandler as Mother’s/Fathers Day Coordinator and Lynelle Sim as Disco Coordinator. Thank you to everyone who attended. 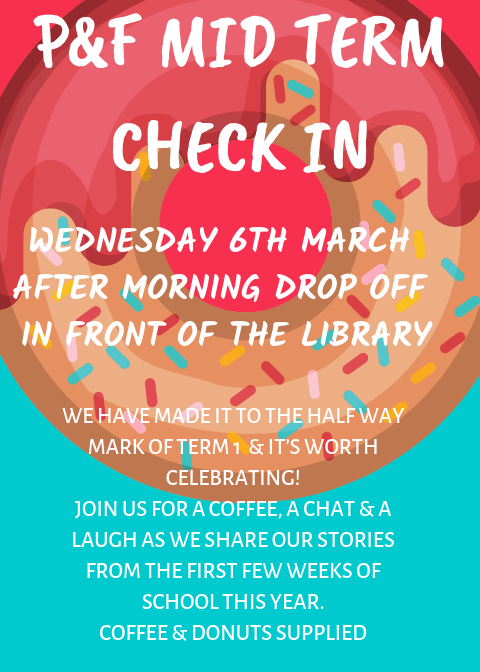 There are some exciting new events that the P and F will be organising this year and we have our first one on Wednesday 6 March, Mid Term Check In. Join us to have a chat, have a laugh and get to know each other, maybe for the first time, maybe a little better, but we would love you to spare half an hour to be a part of this. The P and F now have their very own Facebook Group. Where we will be posting all about the exciting events we will be having this year. Please search GCC P&F. For a number of years the P and F have run the second-hand uniforms for the College, but with the increase in online second-hand sales the P and F have decided to cease with this service. As of 28 February the Uniform Shop will no longer be taking second-hand uniforms for the P and F. Any uniforms up until this date will be processed as normal. After this date you will need to sell yourself online. Thank you the amazing women who have been working so hard for so long to provide this service. Next P and F Meeting Wednesday 13 March, 6:30pm in the library. This entry was posted in P and F on February 14, 2019 by sandy.